Natural Media Experts was founded by Jim Bowes, a natural-media pioneer. Jim founded one of the first natural-media companies called GreenGraffiti® in 2008 and has produced campaigns in countries around the world. In 2015, the rules regulating the use of natural-media in the City of Amsterdam were changed. Using natural-media for advertising or commercial purposes on public property was forbidden. However, using natural-media for Amsterdam’s communication purposes would be allowed. Natural Media Experts was established in 2016 to provide the City of Amsterdam with eco-friendly, urban printing services that allowed them to reach the right people at the right place at the right time. Starting from the kitchen table, Natural Media Experts has grown into a profitable “business on a bike”. First production unit used to produce natural-media campaigns in Amsterdam Zuid. Printing urban communication messages using milk paint. First mobile production unit used to produce natural-media campaigns in Amsterdam. Printing and removing urban communication messages. First three wheel production unit used to produce natural-media campaigns in Amsterdam. Printing and removing urban communication messages using natural paints. 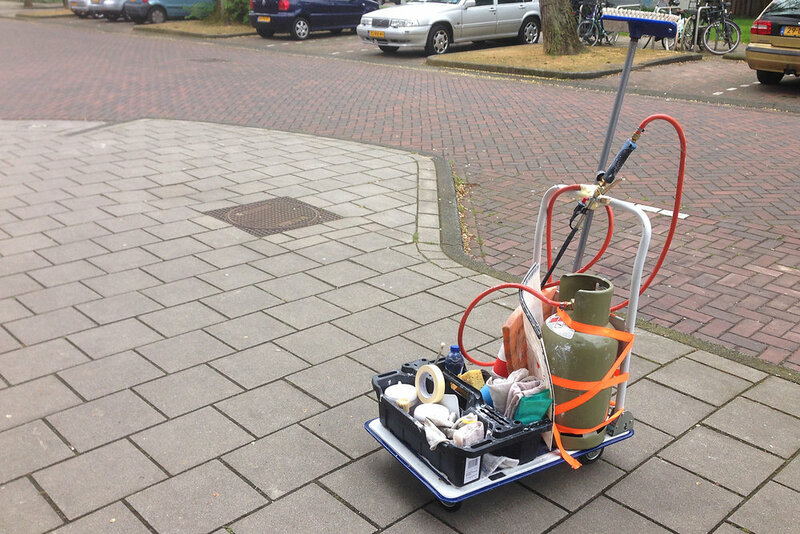 First electrically powered power-washer production unit used to clean away natural-media campaigns in Amsterdam. Eco-friendly city marketing and communiction. Electrically powered power-washer production unit used to clean away natural-media campaign in Amsterdam. Eco-friendly city marketing and communication. Electrically powered cargo bike production unit capable of carrying loads of 150 km with a range of 20 - 30 kilometer. Eco-friendly, Zero emissions transport. Natural-media will become a legal form of outdoor advertising in the future. It offers many benefits for municipalities, local communities and it gives brands the chance to become involved at a local level while generating content for a global audience. Jim Bowes is the founder of GreenGraffiti®. After working in the communications industry for 25 years, he became interested in the issues surrounding sustainable development. Jim left the industry shortly afterwards, running GreenGraffiti® from his kitchen table and watching it grow into an international success in just four short years.